Just over a week ago, the great Hollywood screenwriter William Goldman died in New York at the age of 87. When it comes to late 20th century film, he was a legend, his screen credits including ‘Butch Cassidy and the Sundance Kid’ , ‘All the President’s Men’ (for which he won an Oscar) and ‘The Princess Bride’ (one of my favourite films ever – so much so I still regret not having named either of my children Inigo). He was a master “script doctor” who reputedly saved films like ‘Twins’, ‘A Few Good Men’ and ‘Indecent Proposal’ from obscurity and a wizard with words. And it was he in one of his bestselling books on the art of screenwriting who, while explaining why studio executives invest millions in both films that turn out to be hits and others which flop, coined the much repeated adage: “Nobody knows anything.” Words that should be taken as a reminder to every screenwriter and every programme-maker that ultimately “not one person in the entire motion picture field knows for a certainty what’s going to work”. And if any further proof of “nobody knows anything” rule was needed then it’s worthwhile reading the following article by another great screenwriter Jimmy McGovern, whose script for the much-lauded and double Sandford St Martin Award winning ‘Broken’ sat on a shelf for years before it was made. Many thanks to the Radio Times where this column was first printed in June 2018. I have spent much of my career as a television dramatist trying to give a voice to those whose stories aren’t often heard: the poor, the dispossessed, the wrongly accused, the betrayed. But getting a story made about a parish priest in Liverpool proved to be just about my hardest mission yet. In fact, it was 30 years in the making and very nearly didn’t happen. 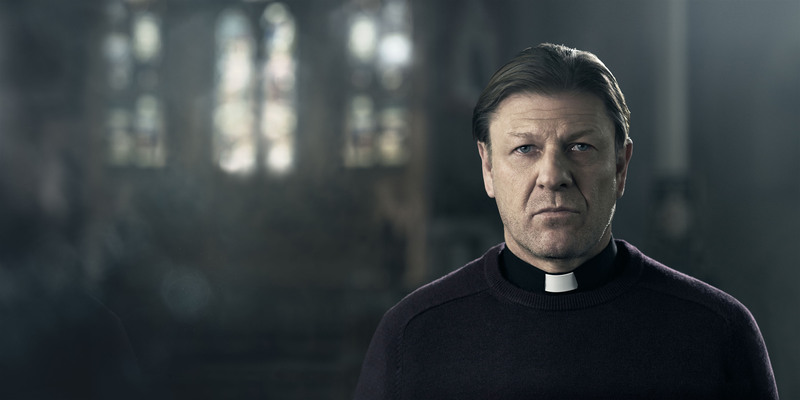 When I set out to write Broken – which I’m thrilled to say Radio Times readers have just blessed with an award at the Sandford Saint Martin Awards – I wanted to write about a fictional priest, Father Michael Kerrigan, played on screen so wonderfully by Sean Bean, serving his parish in a down-at-heel part of north Liverpool. I may no longer be a practising Catholic but I have a lifetime fascination with the faith. Of course, the Catholic church has come in for strong criticism in recent years – and rightly so – but for the last 50 years of my life on Merseyside I have seen nothing but excellent priests. I wanted to put one of those good priests right up there on the screen. The genesis of Broken goes back to 1989. I had given up writing Brookside and I went down to the BBC in London to tell the head of drama that I had a ten-part drama featuring a Catholic priest, with each episode based on one of the Ten Commandments. He turned me down. So I went away and came back with a seven-part drama featuring a Catholic priest, with each episode based on one of the seven deadly sins. And again he said no. Finally, I went back with a four-part drama with each episode based on one of the four Gospels. Again, they said no. In the end I got it down to a single film – Priest. And I only got that made because I had a hit with Cracker (and in fact I wrote the first episode of Cracker on the back of a rejected script for Priest). Nobody at that time wanted to know. The problem was that then, like now, religion sounds boring to some and contentious to others. But what it is to me is a wonderful source of stories about what it is to be human and a huge part of many people’s lives. Father Kerrigan, like all priests, comes into contact with people at massive moments in their life: a birth, a death or a marriage. He regularly hears people confess: somebody who goes along to a priest to confess has something weighing heavily on their soul. Such a priest is living out a faith not defined by dogma but by serving others. He is the kind of man I would aspire to be, but where he differs from me is he never loses sight of his faith – or his vocation. As an inner-city priest you will get nowhere if all you talk about is “bells and smells”. You’ve got to feed the hungry, clothe the naked, visit the imprisoned, help cure the sick. When I go into churches and see a food bank I think isn’t it shocking that there’s a need for this. And then I think, thank God the churches are doing this. They can’t ignore the poverty that’s in front of their eyes – they’d soon get short shrift if they did. Somebody has to. You don’t come across many atheist food banks. We are all called upon to be priests at times, whether we like it or not. A good priest like Father Kerrigan listens to people’s stories, like a good writer tells others’ stories. But turning those stories into TV drama requires faith. Next year is the BBC’s year of belief when the Corporation has committed to covering religion. Drama needs to be part of that commitment, because religion is where so many of the best stories are. To ignore it would be a sin.